This unique award is dedicated to teams and individuals who pioneer and exceed in their fields of expertise. This bold, modern design is engraved on multiple facets of the crystal rectangle column, thus creating a three dimensional effect. 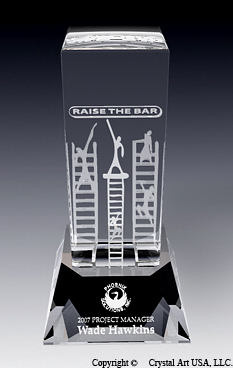 Personalization text and logos are engraved on the crystal base.